50% Longer Run Time. 100% Perfect. Our hot swappable batteries have been transforming patient care globally by ensuring 24/7 Constant Power can be achieved, easily & efficiently. To help clinicians further, we are proud to announce our latest innovation – the XL Battery. The XL battery provides up to 3 times the power output & 1.5 times the capacity of our original hot swappable battery. This is compatible with our existing Medical All In One PCs. Watch the below video to see how Global Digital Exemplar Trusts achieve 24/7 Constant Power within 24 seconds! This Medical All In One PC has hot swappable batteries. Nurses love this as they don’t need to leave Computer Carts at a wall charging. No downtime, for 24/7 workflow. Do You Want 24/7 Constant Power? Derek Lambert – EPR Project Technician, West Suffolk NHS Trust, Global Digital Exemplar. 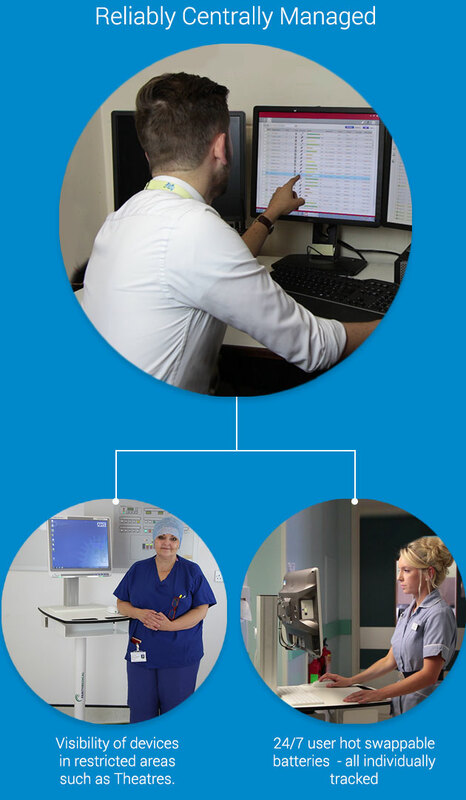 Watch below to see how the entire team at Global Digital Exemplar West Suffolk NHS Trust are delighted with their recent EPR Project using our Medical All In One PCs (with our hot swappable batteries). Staff featured below include the Chief Executive Officer, IT Team & Medical Staff. Watch to see how we’ve helped them achieve workflow needs, improve their Digital Maturity & release more time to care. We are here to help – please fill out the form below. For an instant response, please see the Live Chat pop-out in the bottom right of your screen. Thank you for your enquiry. We will be in touch shortly. If you require an instant response, please use our Live Chat Facility.